M.I.Hummel figurines and plates are the result of a successful partnership between the German porcelain company W.Goebel Porzellanfabrik and a German artist, Sister Maria Innocentia (Berta) Hummel. Franz Detleff Goebel and his son, William, founded the Goebel company in 1871. 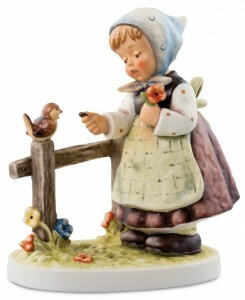 In 1890, the first Goebel Porcelain figurines were introduced. By 1933, there was an extensive line of figurines. Berta Hummel was born in Bavaria in 1909. She was a talented artist from a young age and was enrolled by her father at the age of 18 in the Munich Academy of Applied Arts. Whilst in Munich she befriended two Franciscan Sisters from the Convent of Siessen, a teaching order that placed great emphasis on the arts. Berta decided to enter the convent upon her graduation in 1931. Berta took the name Maria Innocentia on taking her vows, and continued her artistic works, some of which were printed as postcards. Franz Goebel was seeking inspiration and new talent for a new line of figurines, and noticed Sister Maria’s work in a religious art shop in Munich. Franz Goebel was suitably impressed and, after some persuasion, Sister Maria agreed to allow her drawings to be turned into figurines by Franz’s master sculptors, Reinhold Unger and Arthur Moller. 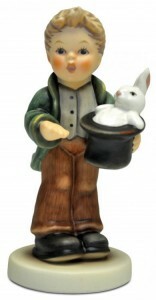 The first M.I.Hummel figurines were introduced in 1935 at the Leipzig Fair and were an immediate success. Sister Maria Innocentia Hummel died in 1946, at only 37 years of age, but her artistic legacy was carried on by Goebel. Today, especially in the US and Germany, Hummel figurines are more popular than ever. Part of this success is due to the terms set down by Sister Maria herself, that the figurines must be true to her drawings and must be of the highest quality. There is still a close link between the Convent of Siessen and Goebel. A collectors club was established in 1977 to promote the figurines and to provide information to collectors. 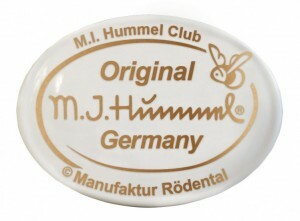 Initially called the Goebel Collectors’ Club, with a name change in 1989 to the M.I.Hummel Club. It was thought this better reflected the interests of its members. Members receive the quarterly magazine INSIGHTS and have the ability to purchase exclusive M I Hummel Club Figurines.